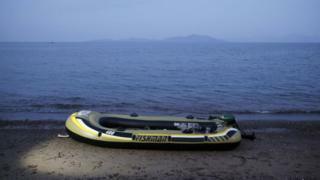 The discovery of migrants' bodies on a Turkish beach is "routine", according to a Welsh man who lives nearby. An image of a young boy - one of 12 Syrians who drowned off the Turkish coast while trying to reach Greece - was captured in Bodrum, sparking an international outcry. Retired police officer Wynn Dunn, 70, originally of Pwllheli, Gwynedd, lives in Turgutreis a few miles away. He said such sights had become a "plain fact" in Bodrum. Mr Dunn, who previously ran a security consultancy and has lived in Turkey for 20 years, said residents have become accustomed to seeing "body bags" near the beach. "Because it's been going on here for so long, it's not so shocking. It's a plain fact," he added. Mr Dunn said, despite recent media attention, bodies have been washing up for some time. "People don't blink about it, it's a regular routine," he added. The picture of the boy, released by a Turkish news agency, is trending worldwide on Twitter under the #KiyiyaVuranInsanlik ("humanity washed ashore") hashtag. Ronahi Hasan, 40, of Cardiff, paid £7,000 to people smugglers to help her make it from Syria to Britain. Mrs Hasan said the 2009 flight from her home in the Kurdish region of Syria - via Jordan and France - was "perilous". "All of the time, you have the fear - especially because I fled with my children. It was very terrifying," she said. "At every checkpoint, I had that fear - would I be arrested? Will they send me back to Syria?" The smugglers moved her using cars and planes. "They are very ruthless people. They are telling you: 'Don't ask any questions, just follow me'," she added. Mrs Hasan, who has refugee status in the UK and is now studying journalism, said she wanted people to understand refugees have "no option" but to seek safety elsewhere. Referring to the photograph of a young boy's body found on a Bodrum beach, she said: "It's breaking my heart watching this news and seeing these terrible images." A Turkish news agency said the boy and the rest of the group were Syrians from the besieged town of Kobane, who had fled last year to escape advancing militants from the so-called Islamic State (IS) group. Thousands of migrants have died this year trying to reach Europe by sea. On Wednesday, First Minister Carwyn Jones said the UK government should find some "backbone" and accept more refugees to solve an "unfolding humanitarian tragedy". Plaid Cymru leader Leanne Wood had accused the Welsh government of not being vocal enough over the crisis. Welsh Secretary Stephen Crabb called on the country to "deal with this as a United Kingdom". There were more than 2,355 people receiving asylum-seeker support in Wales as of April-June 2015, according to the latest Home Office figures. Wales currently takes about 7.6% of the 30,457 asylum-seekers in the UK - an increase from 6.3% in 2012 and 5.3% when the numbers claiming asylum peaked in 2007.